Flood Barriers for Commercial Premises, Garages and Driveways. The Nautilus ® 400 flood defence barriers are our most robust system and can span up to 2500mm without demountable posts. Suitable for installation to both residential and commercial properties. Lightweight high strength aluminium panels. Quick and easy to assemble and dismantle. From flood warning to flood protection in a matter of minutes providing piece of mind. Two permanently fixed vertical side rails are installed at each side of the opening. Ground sockets are installed which are protected by aluminium dust caps when not in use. 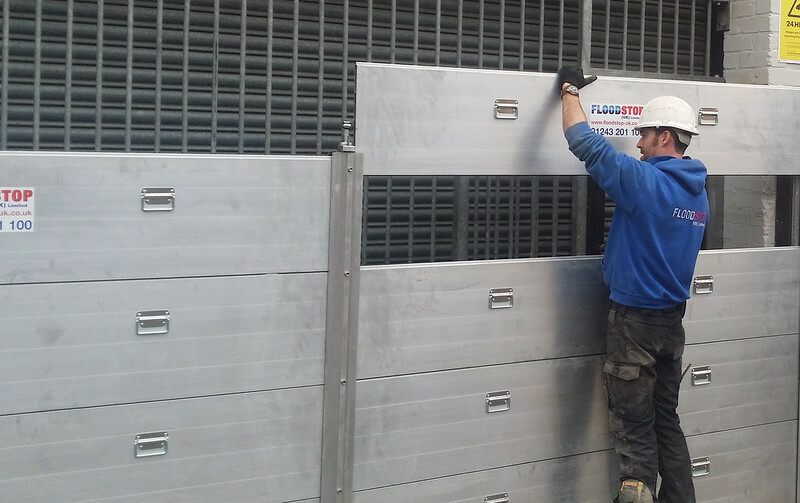 When a flood threatens, simply insert the de-mountable posts into the ground sockets, and then slide in the horizontal aluminium panels and deploy the compression system. The panels are each 400mm high and a barrier of up to 1600mm high can be deployed. Each panel is 25mm in thickness.